The gallery is situated in a converted barn within the National Trust’s stunning Trelissick Garden grounds. 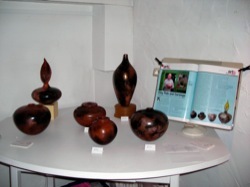 The downstairs is a showcase for work by the Cornwall Crafts Association. An historical Cornish Manor House and 1000 acre Estate leading down to the Helford river. It has a rich history and today is well known for its ‘green’ projects. The gallery houses the main exhibition and retail space for the Cornwall Crafts Association. Formerly The Lizard Cider Barn, the craft centre sells a wide selection of arts made by local painters, potters, jewellers and others. The CCA aims “to promote a greater appreciation and understanding of contemporary design-led craftwork” for craftmakers resident in Cornwall. Ken luckhurst has been a member of the Cornwall Crafts Association for several years.